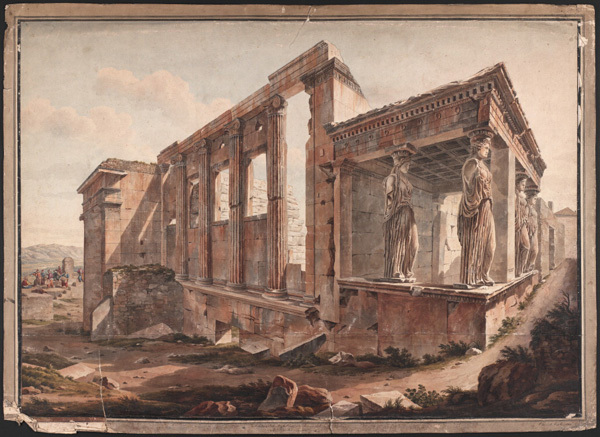 When Englishman Edward Dodwell set out on his second expedition through Greece in 1805-6, he and his Italian artist, Simone Pomardi, were in pursuit of “an accurate exhibition of this interesting country, both with respect to its ancient remains and its present circumstances.” Their resulting sketches and watercolors, displayed in the new exhibition Greece’s Enchanting Landscape, more than fulfill this intent. They provide snapshots of the country’s ancient monuments from an era before photography. The exquisitely rendered pictures by Dodwell and Pomardi capture the clarity of Greece’s blue sky and the rugged landscape that attracted countless writers and travelers during the nineteenth century. 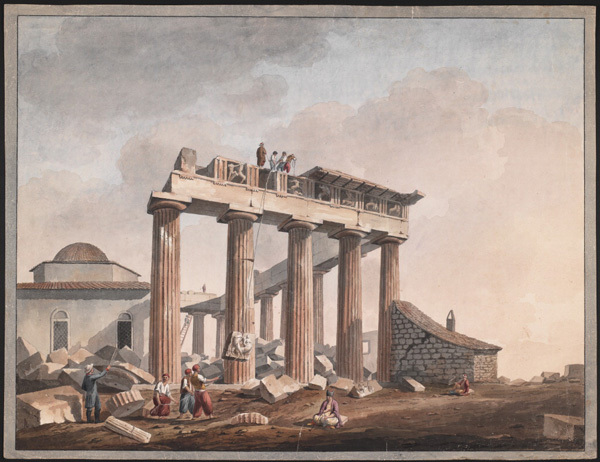 Many of the vistas and prospects in their watercolors have largely been lost today, making these illustrations precious evidence for the appearance of Greece and its villages during the early 1800s. But what has really engaged me in working on this exhibition is Dodwell’s own perspective on traveling through Greece. Thirteen years after concluding his journey, Dodwell published a two-volume account of his explorations, A Classical and Topographical Tour through Greece. (The book has been digitized by the Getty Research Institute, so that it can be downloaded and read at leisure–perhaps even on your digital device for your next trip to Athens). His prose may sometimes be rather overcooked, but Dodwell offers himself as a perfect companion for exploring Greece. In fact, we’ve quoted many passages from his book on the exhibition labels—who better, after all, to tell us what we’re looking at? Dodwell was present in Greece during what proved to be a fascinating and complex phase in the history of classical archaeology, as antiquarians and scholars–men of Dodwell’s ilk–came to the country extolling the grandeur and nobility of its ancient past, seeing what they wanted to see, and, in some cases, taking what they wanted to take. 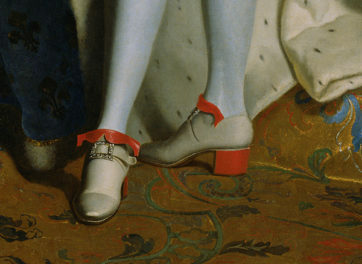 Such comments may leave a sour taste in our mouths today, but they bring to light one of the challenges that Europeans encountered during their travels in the Ottoman Empire. 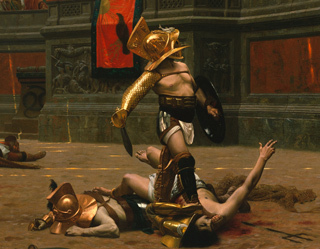 Educated to extol the nobility and virtues of ancient Greece, Dodwell had to relate this perspective to the rather different reality he encountered on the ground: temples left to fall into ruin, once-renowned cities effaced from the landscape, and, perhaps most striking of all, the deprivations faced by the Greek people under Ottoman rule. Dodwell does express his desire for Greek independence, but unlike Lord Byron and others, he seems to have been something of an armchair Philhellene, content to pursue his antiquarian explorations without distraction from contemporary politics. 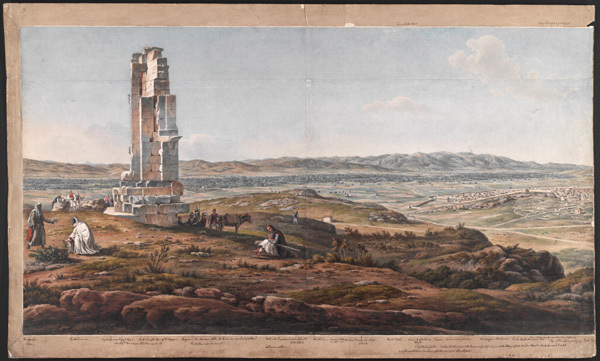 Dodwell and Pomardi’s exactingly precise watercolors illustrate this passion for old stones, and the sweep of their panoramic views is no less comprehensive and all-seeing than their literary endeavors (Pomardi also published an account of his travels, a year after Dodwell). Viewed side by side in our exhibition, the images and texts not only provide a window on Greece in the years before independence, but also convey the outlook of a young man enthused and inspired by the classical past. 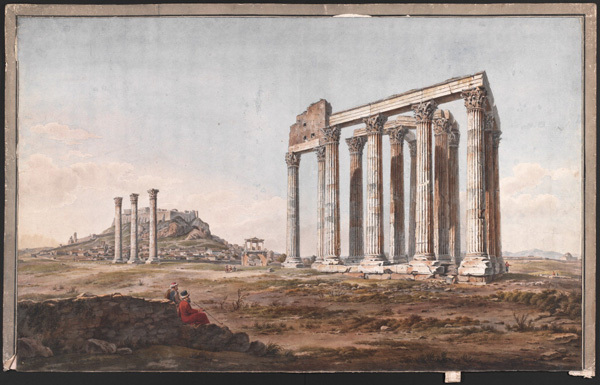 Greece’s Enchanting Landscape: Watercolors by Edward Dodwell and Simone Pomardi features selections from the vast archive of watercolors and drawings in the collection of the Packard Humanities Institute. 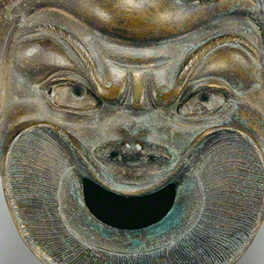 The exhibition is on view at the Getty Villa through February 15, 2016.